Does a heat pump need planning permission? Many properties will be suitable for a heat pump but it is often the plot that dictates which type of heat pump would be best suited. Generally, to see a significant saving, a heat pump is best suited to a property that does not have any access to mains gas, as these are the properties that have the potential to benefit the most from renewables. But does the plot itself have a part to play? 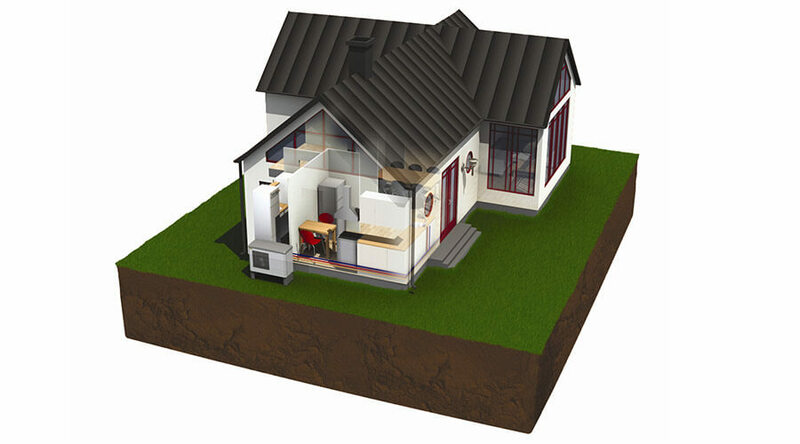 Ground or air source heat pump? A ground source heat pump (GSHP) needs space for the ground loops – the available land needs to be at least two and a half times larger than the entire floor area of the property. There also needs to be space for a plant room to hold the heat pump and cylinder. Because of this, only larger properties or those in a rural location are generally suited to a GSHP. The alternative is to drill a series of vertical boreholes that will carry the ground collector pipe. Air source heat pumps (ASHP), on the other hand, are suitable for a wide range of property sizes and require little space. The heat pump unit sits outside and because there’s no need to dig trenches for ground loops, it is a lot quicker and easier to install. Apart from building a plinth there are no groundworks needed. This is a good option for anyone on a tight build schedule and also a smaller budget. Permitted Development Rights permits some limited minor changes to a property without the homeowner needing to apply for planning permission. Typically, a GSHP installation will fall under Permitted Development because the heat pump will be out of site, within a plant room. However, if the unit is being installed in a listed building or within an area of conservation then it would be worth checking the specific rules and regulations with your local council. A large percentage of ASHP installations will also fall under Permitted Development, but the fact that ASHPs do generate some noise means that their location can be an issue, sometimes requiring Planning Permission. This ought to be checked before going ahead with the installation, just in case permission is needed beforehand. An ASHP installation must either be classified as Permitted Development or receive Planning Permission and, to achieve Permitted Development the ASHP installation must comply with certain standards. For more information on Permitted Development and the potential need for Planning Permission, download our information sheet. The Renewable Heat Incentive (RHI) aims to offer a real incentive to install renewable technologies, such as heat pumps, to heat homes. The scheme offers quarterly payments to homeowners over a period of 7 years, based on estimates of a household’s annual heating consumption. For more information on the criteria put in place and whether the property and system are eligible for the RHI, we recommend you contact Ofgem. You can use Nu-Heat’s heat pump selector tool to determine if a heat pump is suitable for your project.